In the tradition of Judy Blume, debut author Kristi Wientge tackles the uncomfortable—but all too relatable—subject of female body hair and self-esteem with this “sparkling and triumphant tale of a middle school misfit” (Heather Vogel Frederick). With everyone around her focused on other things, Karma is left to figure out what to make of her terrifyingly hairy surprise all on her own. Dadima used to say I’d be as strong as a lion if I drank milk twice a day. She never mentioned I’d get as hairy as one too. There should have been a disclaimer—bold letters and a voice-over with a list of side effects scrolling along the side of my grandma’s face whenever she handed me a cup of hot milk. Daddy’s back was to me as he pried paratha dough off the rolling pin in a misshapen glob. The orange ties of his Karma Is Served apron clashed with the pale green of his turban. He loved that he’d found an apron with my name on it, but whenever he reminded me for the hundredth time that he was wearing my name, I had the urge to accidentally spill curry down the front of the apron. Once he had the paratha on the smoking pan, I tipped the milk he’d poured for me into a potted plant next to me. This entire summer the universe had been against me. The hair on my face just happened to be the most recent tragedy. The worst part was, I didn’t know how to get rid of it. Luckily for me, my best friend, Sara—a walking, talking guide to fashion and personality quizzes—had returned from vacation. She’d just called to figure out what time I should be at her house that afternoon to compare notes on our class placement lists, which had just arrived in the mail. Thank Babaji we were in the same block. The almost-burned smell of Daddy’s parathas on the roti pan that Dadima’d brought from India stirred a lump behind my heart, which I quickly tried to ignore. Parathas hadn’t been the same since Dadima had died last summer. I cupped my hand over the mouthpiece of the phone when Daddy turned back to the stove. “I’m serious, Sara. There are exactly seventeen of them.” I pinched the hairs above my lip, hoping no more had grown. I didn’t want to show up at orientation with a mustache, even if Sara would be there at my side. “Mmm-hmm.” Sara’s breath rattled through the phone. I pictured her blowing a loose strand of hair out of her eyes. This was the second time I’d brought up my mustache to her. She wasn’t paying attention. Again. Daddy pushed a hot paratha across the counter to me. It wasn’t exactly square-shaped like Dadima’s used to be, but anything tasted better than Mom’s freezer-burned casseroles. He reached across the counter and held out the carton of milk. I slid my hand over the mug and shook my head. “What about being strong—” Daddy started to say. “As a lion?” I went to the fridge and grabbed the orange juice. Overdosing on milk probably hadn’t given me my mustache, but Daddy had stopped buying organic now that he was a stay-at-home dad. I’d overheard Mom tell him that the hormones in non-organic milk weren’t good for girls. So, for the past two weeks I’d been dumping my milk into the nearest potted plant whenever Daddy wasn’t looking. “What about lions?” Sara asked. Sara hadn’t said “werewolf” as an insult, but now that the idea had been verbalized, it was free to run wild. It existed now. I could imagine the boys at school saying it with smirks on their faces. Friday. At orientation, ruining the school year before I even had a chance to make my own first impression. “Yeah, okay. See ya later.” I tore off a piece of paratha and dabbed it into the stream of melted butter that ran through the middle of the rhombus-shaped bread. “Watch this, beta,” Daddy said, trying his hand at tossing another paratha into the pan with a flip of his wrist. He’d definitely watched too many cooking shows recently. I finished breakfast as quickly as possible. The phone call with Sara left me shaky. She’d only been on vacation for two weeks, but the space between us that had always been pulled together like we were two attracting magnets now felt like it was pushing us apart, as if her pole had flipped. Once I saw her, it’d probably all go back to normal. I mean, she did only come back last night, and it was a long drive from her cousin’s house in South Carolina. “Thanks, Daddy.” I kissed him on the cheek and rushed upstairs to claim the bathroom before Kiran. Once I’d locked the door, I leaned close to the mirror to get a good look at my face. I counted again. Yep. Seventeen. Seventeen hairs on either side of my upper lip. How many hairs made a mustache? At least twenty? I hoped it was at least twenty. Fifty or a hundred would be perfect. The further away I was from having a real-life mustache, the better. Best of all would be finding a way to get rid of it, especially before school started. The hairs around my mouth were dark enough that each strand was visible. When I stretched the skin, I could pinpoint each pore that a hair grew out of, the way grass sprouted out of a sandbox. My Horrible Histories books mentioned that ancient monks rubbed stones on their heads to make themselves bald. After reading that a couple of weeks ago, I started to rub the sides of my mouth in circles with my finger, in the hopes that the motion would work for my face. It wasn’t exactly scientific, but it was the only thing I had, considering Mom didn’t own a single pair of tweezers and she drew in her barely-there-blond eyebrows every morning, and Sara hadn’t been very helpful on the phone. But all that the rubbing had done was make the sides of my mouth red and chapped. I turned the water on to cover up my ritual. I knew it was silly, but at least everyone would think I’d brushed my teeth really well. “Hurry up!” Kiran yelled, banging on the door. I squirted toothpaste into my mouth and swished some water around. I also ran my toothbrush under the water so it looked like I’d brushed properly. Kiran stood outside the door when I opened it. His black hair stuck out at random places, and his breath stunk worse than the tennis shoes he’d been mowing in all summer. “You forgot to shave,” he said, and pinched the hair at the edges of my mouth. It annoyed me that he knew what I’d been doing, even though I’d left the water running. “Stop it, jerk.” I swatted his hand away. He was fourteen and probably wanted a mustache, so why was I the one with hair on my face? 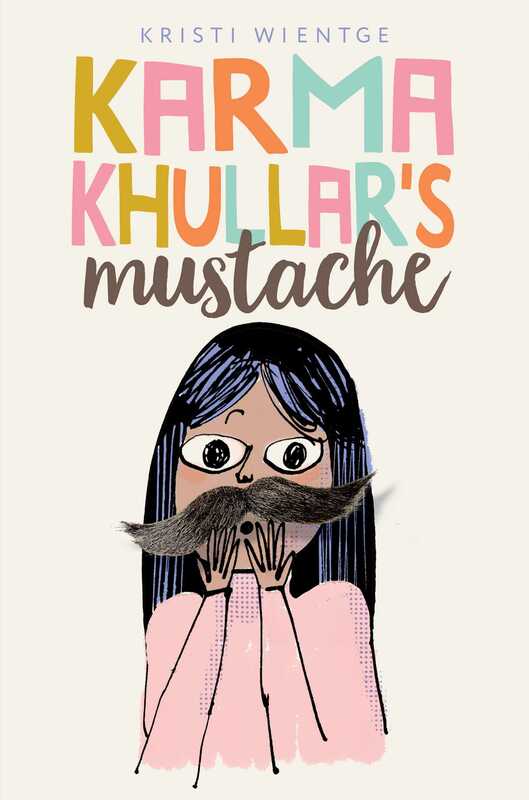 As if starting middle school isn’t scary enough on its own, Karma Khullar has to deal with a lot of other life changes at the same time. Her dadima has recently passed away, her father has become a stay-at-home dad, her mother has a new time-consuming job, and her best friend Sara wants to spend all her time with Lacy, her popular new neighbor. On top of all that, Karma has recently grown a mustache—seventeen black hairs, to be exact! She’s nervous and self-conscious and isn’t sure how she’ll navigate her new life without her usual support network. Once school starts, it’s up to Karma to figure out how to live up to her name and attract the good karma that she needs to survive sixth grade. 1. Why do you think Karma is so fixated on the emergence of her new mustache? Describe and discuss some of Karma’s emotions associated with the mustache. Is she overreacting? How would you react if you were her? 2. Karma’s dad recently lost his job and has taken on a new role as a stay-at-home parent. Why do you think this is a hard adjustment for Karma? How do you think her dad feels about this new situation? How does his new role affect their relationship? 3. Compare and contrast the friendship between Sara and Karma and the friendship between Sara and Lacy. Why do you think Sara is drawn to Lacy when she moves to town? 4. When Karma feels that Sara doesn’t care enough about her mustache she says, “a best friend should think my big deals were her big deals.” What does Karma mean? Do you agree with her? Do you think that’s an important part of a friendship? 5. Discuss Karma’s relationship with Dadima. What were some of the important lessons that Dadima taught Karma and how did Karma apply those lessons to her life? 6. Karma’s brother, Kiran, loves music, and their mother encourages his exploration of the arts. However, Karma’s dad would prefer that he focus on the sciences. How do the arts differ from the sciences? Why do you think Karma’s parents have different opinions on what’s important? Do you think one is more important than the other? 7. Every day Karma brings her tiffin filled with Indian food to school. It’s a source of both comfort and embarrassment for her. Discuss why it makes her feel these two very different emotions. Why do you think she chooses to continue bringing her tiffin to school at the end of the story? 8. Dadima taught Karma that the idea of karma is better explained by thinking “your actions start a trail of reactions” instead of thinking that “what goes around comes around.” How are these two ways of looking at karma different from each other? Describe a time when your actions started a trail of reactions. 9. As Karma begins to keep track of her karma points, she has a list of vices to avoid, including anger, pride, greed, and attachment to things of this world. Consider a time when you exhibited one of these vices. What happened? Is there anything you could have done differently to improve the situation and how you felt? 10. There are several instances in the book when Karma wishes Sara would stick up for her but Sara stays silent and ignores the situation. Karma says “until Sara had sat quietly around this past week, I never really got it that sometimes the silence hurts worse than the teasing.” What does Karma mean by this? Do you agree or disagree? 11. When Karma goes to Lacy’s house to tutor her, she discovers that Lacy and her mother are having a hard time adjusting to their new town. She also learns that Lacy was held back a year in school. How do you think Lacy’s home life and being held back affect her behavior toward others? 12. Go back to chapter 24 and reread the story that Dadima told Karma about the potter and his lump of clay. Discuss the significance of this story and why it has suddenly become very meaningful to Karma. 13. When Karma’s mom discovers her shaving in the bathroom, she admits to Karma that she’s been preoccupied and regrets that Karma hadn’t wanted to discuss her mustache with her. How does this represent a turning point in their relationship? What changes between them after their conversation? 14. At the end of the novel Karma says, “Things weren’t exactly the same as the old way, but I was learning to be comfortable in the newness.” What does she mean by this? Describe a time when you had to adjust to a new situation. Were you able to find comfort in the newness? 15. When Ginny gives Karma a bumper sticker with her name on it, Karma can’t wait to go home and hang it next to the one from Sara. Why is this significant? How have Karma’s thoughts on friendship shifted throughout the book? 16. How have the characters changed at the end of the novel? Who changed the most? What events do you think contributed to that character’s progression? 17. Why do you think the author chose the name Karma for her narrator? How did the name Karma help shape the character? 18. Discuss an instance of peer pressure in the novel. Have you ever felt peer pressure to do something you didn’t want to do? How did you react? 19. Throughout the novel, Karma is referred to as “Stache” and “Stache attack.” Discuss some reasons why name-calling is very hurtful. Why do you think that some people resort to these hurtful tactics? 1. In the novel, Karma decides to keep track of her “karma points.” She would give herself points for not getting angry, prideful, greedy, or showing attachment to the things of this world. If she caught herself having any of these vices, she’d lose points. Try keeping track of your own karma points for one morning. How many points did you end up with? Is it difficult to avoid certain vices? Did you discover anything about yourself in this process? 2. When Karma goes to tutor Lacy for the first time, we read about the experience from Karma’s point of view. Rewrite this scene from Lacy’s point of view. Consider what Lacy would say about her mother’s behavior and admission that Lacy was held back, how she would feel about having Karma over to her house, and how she would feel about needing a tutor. 3. Mrs. Clark suggests that each student come up with a big idea to put in the suggestion box. Come up with your own big idea for your class. Explain why your idea would be successful. Just like in the novel, your idea should be about making learning engaging beyond the classroom. 4. The food that Karma brings in her tiffin to school is unfamiliar to her classmates but it’s very normal for Karma because it’s part of her family’s culture. Think of a food that represents your family’s culture. Write about a memory you have that involves eating this food. 5. There are many instances of bullying throughout the novel. Brainstorm ways that you can help prevent bullying in your school. Write a letter to your teacher presenting your ideas and explaining why bullying prevention is so important. Guide written in 2017 by Laura Swerdloff Moreno, an elementary school teacher. "I was immediately captivated. Growing up in a Punjabi household and having facial hair at the same age as Karma, her story and hardships sounded very similar to mine...I will most definitely be sharing this book, story and the lessons inside it to my younger siblings and future children." "Debut author Wientge has sensitive, anxious Karma confronting the universal preteen problems of self-esteem, bullying, and changing friendships, with everyday details of her interracial family's Sikh faith and culture seamlessly woven in . . . Readers will enjoy seeing how Karma navigates the complexities of adolescence, middle school, and the 17 hairs on her upper lip in this realistic and humorous story of new friendships and family support." "In Karma Khullar's Mustache, Wientge's creates a poignant, complex, and humorous world for the strong, but sensitive Karma. A beautiful, streamlined read for anyone struggling with common middle school issues like friendship, identity, family problems, and body image." "Debut author Wientge neatly captures how it feels to be different, especially as an adolescent . . . The novel’s ending—hopeful but not completely happily-ever-after—sends a strong message of self-acceptance and resilience." "Funny and relatable, this is a solid pick for those transitioning to middle school." "This is a smoothly realistic and heartfelt exploration of an ordinary middle-schooler with problems aplenty and just enough courage to solve them."